We’re all excited to see Avengers: Infinity War, the culmination of the ten-year-old Marvel Cinematic Universe (MCU). But some of us haven’t seen all the films, or are dragging along a significant other to the theater who doesn’t know Iron Man from Captain America. The dilemma? 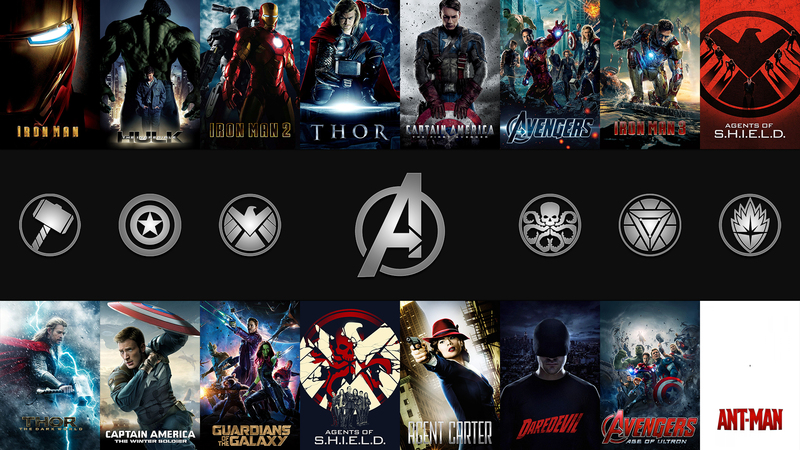 There are 18 MCU films and so little time to see them all before Avengers: Infinity War premieres. So which films do we need to watch before seeing Avengers: Infinity War? After all, not all the MCU films are relevant to the coming epic film. Listed below in alphabetical order are ten MCU films to see before Avengers: Infinity War that are essential for understanding the film-spanning saga. Keep in mind that not all the films are the best in quality but have important ties to the Infinity War saga. Some spoilers follow. It makes sense to see the very first Avengers film. The superhero team gathers together for the first time to combat Loki, who threatened the world. The Avengers has the first appearance of the Mind Stone, one of the Infinity Stones, which was used by Loki. It also prominently features the Tesseract, aka the Space Stone, also used by Loki to transport invading alien armies to Earth. More importantly, the post-credits scene of The Avengers introduces us to Thanos, the looming threat throughout the MCU from that point on. Overall, the first Avengers film takes the first steps to set up Phase Two and Three of the MCU, which culminates with Avengers: Infinity War. The sequel to The Avengers was somewhat disappointing with one of its flaws being its shoehorned tie-ins to the Infinity War saga. Two of the Avengers (Thor and Iron Man) have prophetic visions about the Infinity Stones and Earth being imperiled. This leads to Thor leaving the team (and Earth) to learn more about the Stones while Iron Man becomes even more obsessed with protecting the world. His actions from that point are responsible for creating the film’s villain, Ultron, and the newest Avenger, Vision, one of the major characters in the third Avengers film. The Mind Stone, which was in Loki’s staff from The Avengers, is later imbedded into Vision. 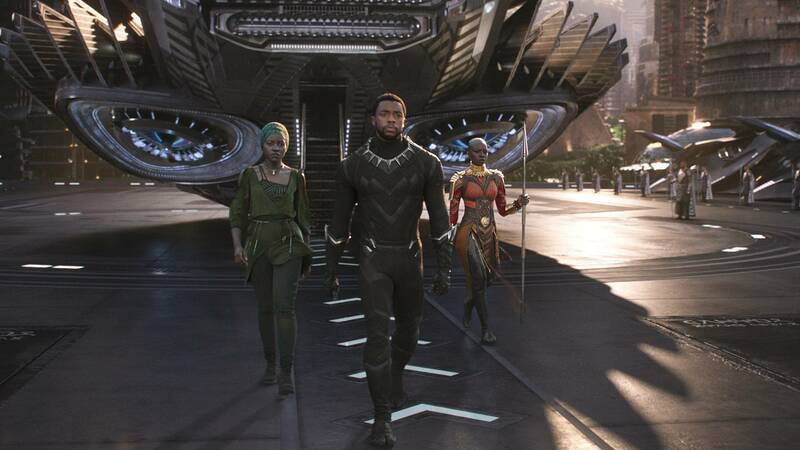 No Infinity Stones are seen or mentioned in the recent box-office phenomenon, but Black Panther properly introduces audiences to the wondrous African kingdom of Wakanda, a major setting in Avengers: Infinity War. As we have seen in the trailers for the film, it appears that the climax takes place in Wakanda as our heroes take a last stand against Thanos and his forces. Black Panther also introduces us to major players in Avengers: Infinity War, namely Shuri and Okoye. Shuri with her technical prowess and Okoye being a mighty warrior have been shown in the trailers to being essential to the film’s story. As with Black Panther, the third Captain America film does not feature the Infinity Stones, but is very important to the Infinity War saga. Chiefly, it sets up the characters’ situations for Avengers: Infinity War. The Avengers break apart due to the events in Captain America: Civil War, which leaves the team(s) weakened and Earth vulnerable. The third Captain America film (sometimes described as Avengers 2.5 with all the appearances of the Avengers) also introduces two important characters in the MCU and the Infinity War saga, Black Panther and Spider-Man. These new breakout heroes could also be seen as the ones to carry the torch for new versions of the Avengers after the dust settles in Avengers: Infinity War. The first solo film of the MCU’s most popular superhero not only introduces the star-spangled Avenger, but the first Infinity Stone onscreen: the Space Stone, which is inside the cubical Tesseract. Technically, the Tesseract was first seen briefly in a post-credit scene in Thor, but here the object is fully fleshed out. It was used by the Red Skull to wreck havoc in Europe during World War II. In the first appearance of an Infinity Stone, it was also the first time that these stones were weaponized. 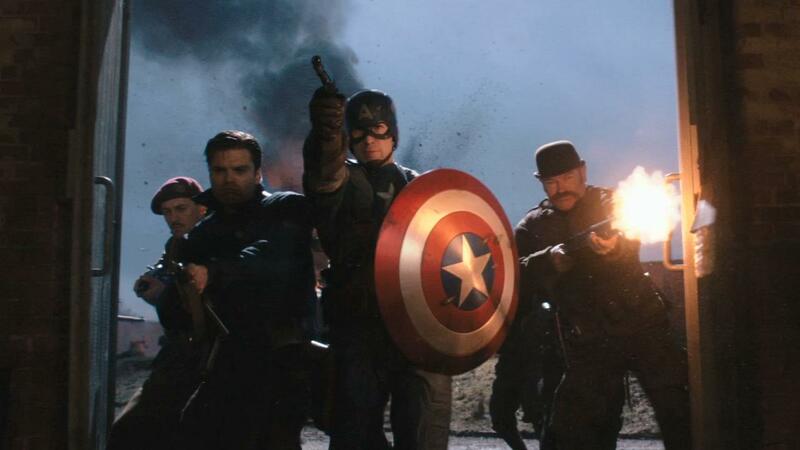 Its true power was barely tapped in Captain America: The First Avenger as its full potential was shown in The Avengers. WARNING: The following will discuss major spoilers in Captain America: Civil War, anyone who has not seen the film yet and do not want to be spoiled should stop reading from this point on. Captain America: Civil War, like the previous Captain America films, has had a profound impact in the Marvel Cinematic Universe (MCU). The biggest fallout from the deteriorated relationship between Steve Rogers/Captain America and Tony Stark/Iron Man being the disintegration of the Avengers team. Naturally, we cannot expect this situation to last in the MCU. Despite the world’s animosity towards superheroes, it does need a superhuman team to take on the larger-than-life threats. What will likely happen in between this film and the next Avengers film is that the team will be reformed. As to who will make up the new Avengers is open for speculation. But if the Marvel Studios films loosely follow what happened in the comic books then there might be two teams of Avengers in Avengers: Infinity War, Part I (at this point we don’t know what the film’s new name will be so let’s call it by its original title for now). In the Marvel Comics following the Civil War mini-series there were two Avengers teams, one was known as the Secret Avengers and operated outside the law and there was the “official” Avengers, which was later infiltrated with nefarious sorts and morphed into the Dark Avengers. Avengers: Infinity War could roughly follow this development by having Tony Stark leading a new team composed of Vision, Wonder Man (Nathan Fillion will cameo as Wonder Man’s civilian identity of Simon Williams in Guardians of the Galaxy, Vol. 2, so he is a natural to play Wonder Man–a casting decision we foresaw years ago), a new Captain America, Captain Marvel (someone that the film’s directors, Joe and Anthony Russo, have suggested may appear), and someone new to the MCU perhaps She-Hulk or Tigra or even Black Knight. Now the film could be about how the official Avengers are treated as celebrities, but the reality is that many of the new recruits are traitors. Think about it. This plot twist would be a variation of the Thunderbolts’ first storyline and Wonder Man’s initial appearance. When Wonder Man first joined the Avengers he was supposed to betray the team but had a change of heart and became an actual hero. The original Thunderbolts team was actually Baron Zemo and his Masters of Evil, who were pretending to be heroes. This twist could be unveiled to audiences who would be shocked that new recruits like Tigra or Black Knight are actually supervillains and Zemo was behind the scenes plotting this machination much like he did in Captain America: Civil War. Meanwhile, Steve Rogers could adopt a new identity as either Nomad or the Captain as he did in the comic books. He would be without his shield, which he abandoned at the end of his third film. The new, evil Captain America (who can be Johnny Walker, the future U.S. Agent) could be the one wielding the shield while Rogers could use an energy shield like the one that Phil Coulson used in a recent Agents of S.H.I.E.L.D. episode. Of course, by the end of the film Rogers will rightfully regain the real shield. It could be given to him by Stark as a symbolic way of renewing their partnership. 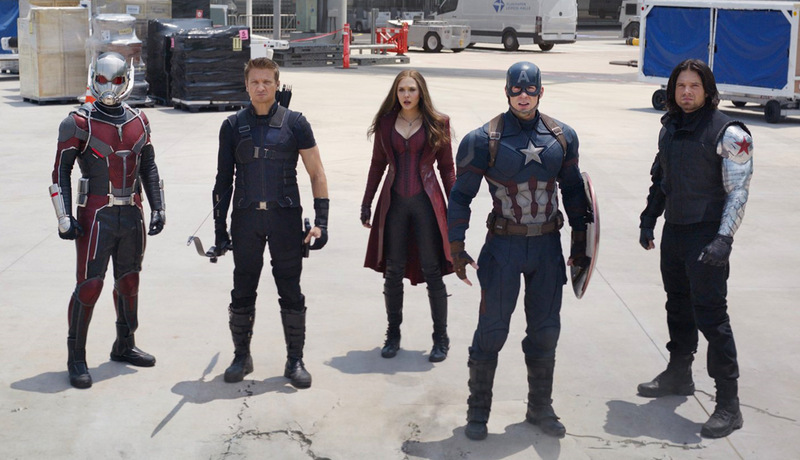 Before that happens, Rogers will probably be leading his own clandestine team made up of Scarlet Witch, Black Widow, Ant-Man and the Wasp and Falcon. So, Secret Avengers, Dark Avengers, what does any of this have to do with Thanos and the Infinity Gauntlet? Perhaps Thanos’ team of the Black Order could show up on Earth looking for the final Infinity Stone, which happens to be embedded on Vision’s forehead. The aliens defeat the Avengers and take the Stone or are behind the betrayal. This would lead Stark and Rogers to realize they have to join forces to combat Thanos and the film ends. Cue the post-credits scene with a triumphant Thanos and his completed gauntlet. OK, so what about the rest of the MCU? 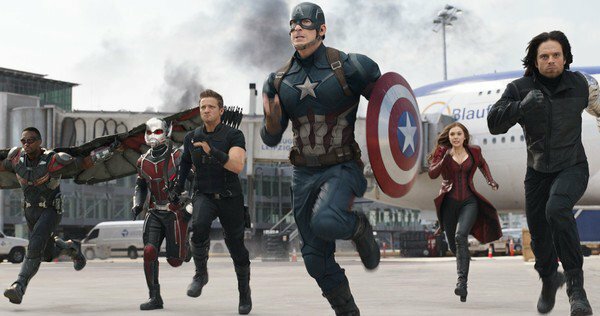 How does Captain America: Civil War affect it? To be honest, it may have minimal impact outside of the third Avengers film and the Black Panther solo film, and the reason can be seen in the lineup of films between Captain America: Civil War and Black Panther. Up next is Doctor Strange, which seems likely to be set apart from the traditional MCU. Unlike Ant-Man, do not expect to see an Avenger making a cameo in Doctor Strange. At best, there may be a reference to one of the Infinity Stones. The same situation will apply to Guardians of the Galaxy, Vol. 2. 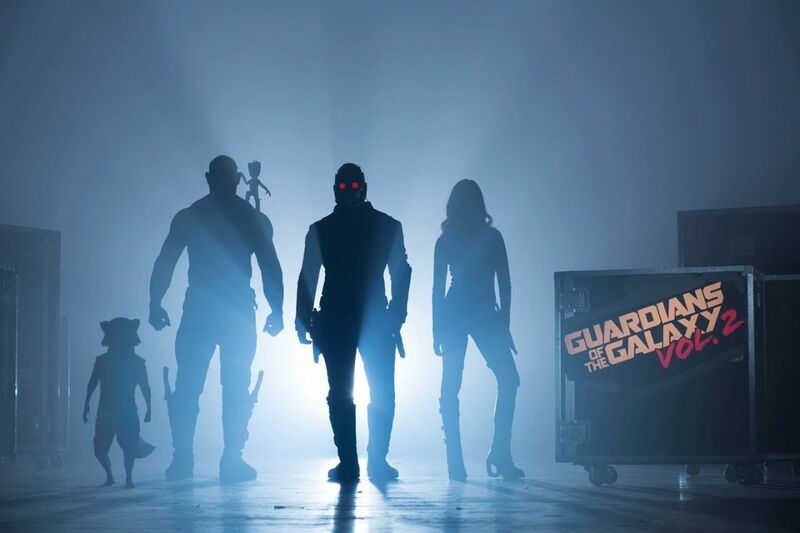 That sequel takes place in outer space and according to director James Gunn, doesn’t have anything to do with Thanos. 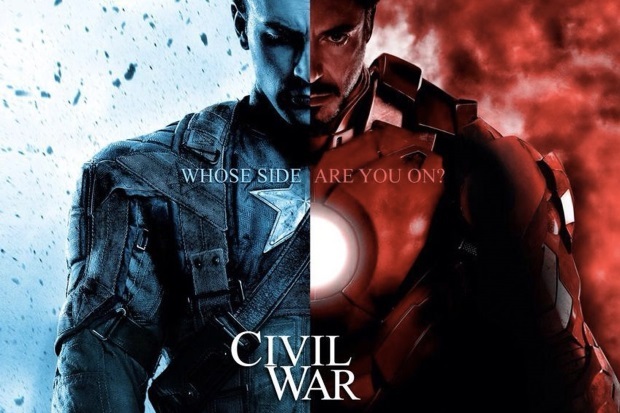 Captain America: Civil War is the culmination of the first two phases of the Marvel Cinematic Universe (MCU) and launches Phase Three in a bold and somewhat darker direction. That is because by the end of the film, relationships are frayed, perhaps permanently, and new players have arrived to carry the torch. A first look at the cast of characters appearing in the film, which includes most of the Avengers, may lead one to believe that the film should have been called Avengers 2.5, but this is first and foremost a movie about Steve Rogers/Captain America (Chris Evans). We see that he is still struggling to fit into the modern world being that he is a product of long bygone era. The movie is also a direct continuation of the previous film Captain America: The Winter Soldier in that the Winter Solider aka James “Bucky” Barnes (Sebastian Stan) is the focus of pursuit for everyone. At the same time, the events at the end of Avengers: Age of Ultron play a major factor that somehow manages to validate that film since it is considered to be an inferior sequel to The Avengers. The destruction in the country of Sokovia at the end of Avengers: Age of Ultron added to the world’s growing unease with superpowered people. This suspicion is compounded after the opening segments of Captain America: Civil War when innocent civilians are killed during a fight the Avengers have with terrorists. Enter: The bureaucrats in the form of U.S. Secretary of State Thaddeus Ross (William Hurt) who demands that the Avengers sign an accord by the UN that places the superhero team under supervision and dictates that they cannot act unless ordered. Steve Rogers objects to this, but his fellow partner and Avenger Tony Stark/Iron Man (Robert Downey, Jr. ) disagrees. 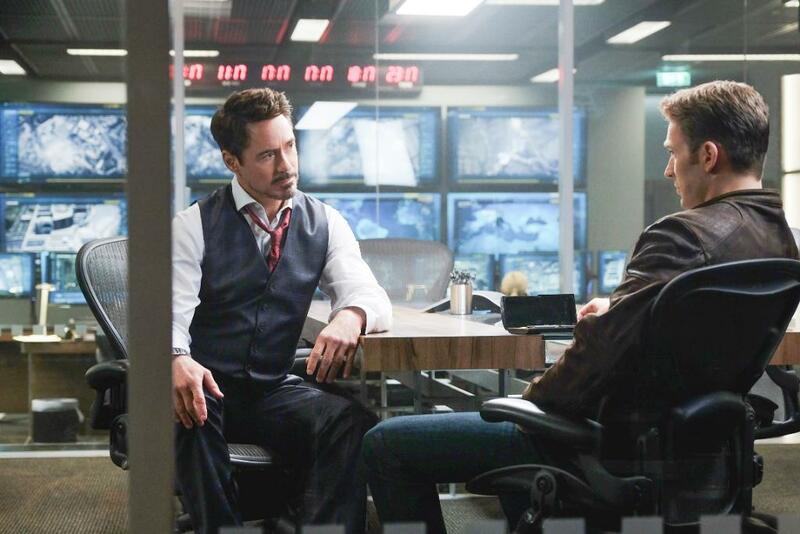 He feels that superhumans need to be curtailed partly based on his own guilt about creating Ultron. Later, a terrorist bombing at a UN conference, supposedly by the Winter Soldier, sets off an alarming series of events that turn the two friends into bitter enemies as both men gather allies for their causes. Captain America: Civil War is already considered one of the greatest superhero films of all time and that praise is justified. Unlike the similar-themed Batman v Superman: Dawn of Justice, this film flows cleanly, is coherent, not choppy and adequately presents both sides of the issue. 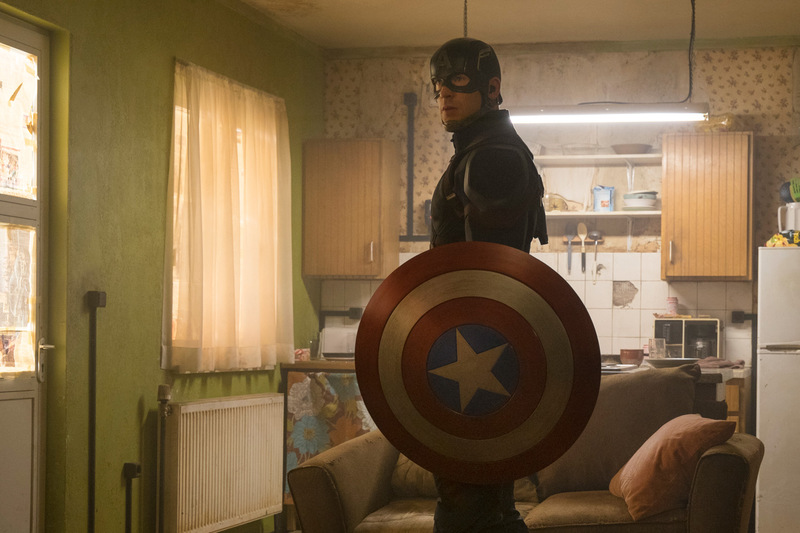 Even though Captain America is the star of the film, great pains are taken to show the validity of the other side. It becomes difficult at times to find someone to root for because we know they are both in the right. It illustrates the tragedy of a civil war amongst former friends. The directors Joe and Anthony Russo return for their second Captain America film and have beaten the second film curse for MCU directors. 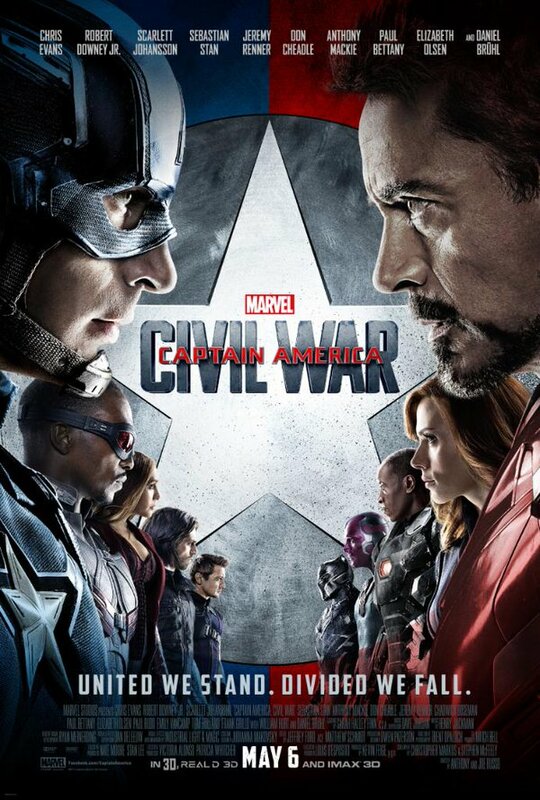 At the same time, they demonstrate with Captain America: Civil War that they can handle a large, epic story with multiple characters that are all given their moments to shine. That is an unbelievable effort that lesser directors and writers have difficulty accomplishing. Despite the film’s length (over two hours) it leaves viewers wanting to see more of this world unfold. That is due to the constant action, fast-moving plotline, and smile-inducing appearances by other characters that get their moments in the sun and not just in action sequences. We meet T’Challa/Black Panther (Chadwick Boseman), a noble African king out for vengeance, and of course, everyone’s favorite Web-Slinger, Spider-Man (Tom Holland). This MCU version of Peter Parker is the most authentic and realistic take of Spider-Man ever shown on film and leaves one hungering for Spider-Man: Homecoming already. Other stand out characters include Wanda Maximoff/Scarlet Witch (Elizabeth Olsen), the Vision (Paul Bettany), Clint Barton/Hawkeye (Jeremy Renner) and Scott Lang/Ant-Man (Paul Rudd). The much talked about fight scene the superheroes have with each other in an airport is worthy of the hype and shows the heroes at their best. It was a comic book fan’s dream come true seeing all these superheroes doing their thing. Needless to say the special effects were flawless, as was the intricate fight choreography. 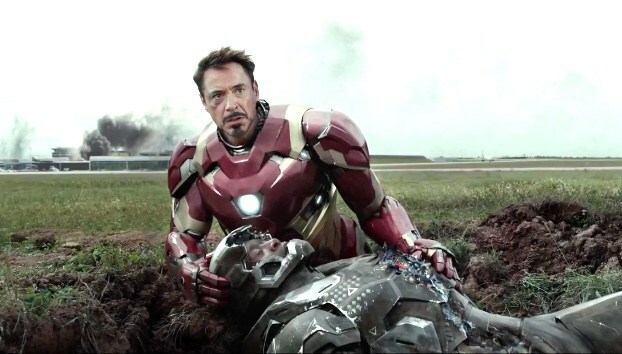 However, a following fight scene later on is much more involving and personal, while at the same time heartbreaking as we see that Rogers and Stark are at a point of no return with each other. By the end of the film, everything has changed not just for the two main characters, but for the allies that took their sides. 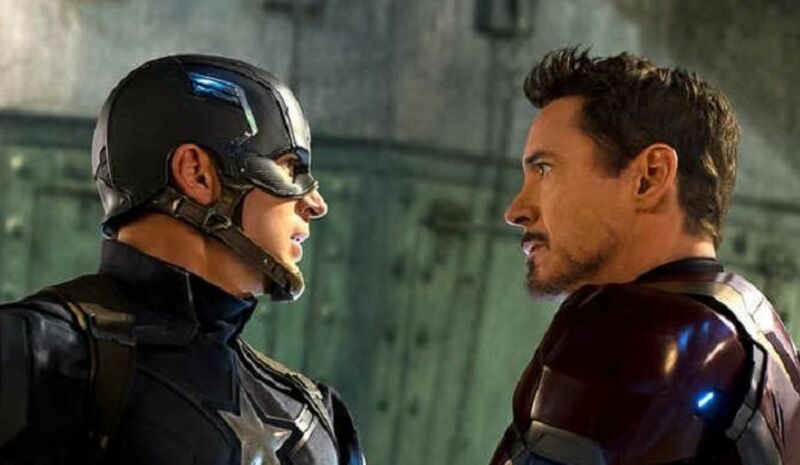 Captain America: Civil War is a triumph that is worth multiple viewings not just because of the spine-tingling action but because at its heart the movie is about friendship and how it gets fractured. It is hard to believe this but even though this is Marvel Studios’ thirteenth MCU film, it proves that the Marvel Cinematic Universe can still surprise and excite us as it continues to expand. Marvel Studios is launching Phase Three of their Marvel Cinematic Universe (MCU) with the release of Captain America: Civil War. It is hard to believe that less than ten years ago, the superhero film landscape changed forever with the 2008 release of Iron Man, considering he was not a top-tier character in the Marvel Universe. But, the film turned out to be much better than most expected and the very tail end of the film tantalized fans with the promise of a larger film universe when Nick Fury appeared and mentioned that not only were there other superheroes but that a team called the Avengers was planned. This was a spectacular, game-changing moment in superhero films. Never before had superhero films spawned a viable universe. Of course, the original Superman films and Daredevil had spinoff films but they were dead on arrival and seemed like afterthoughts. 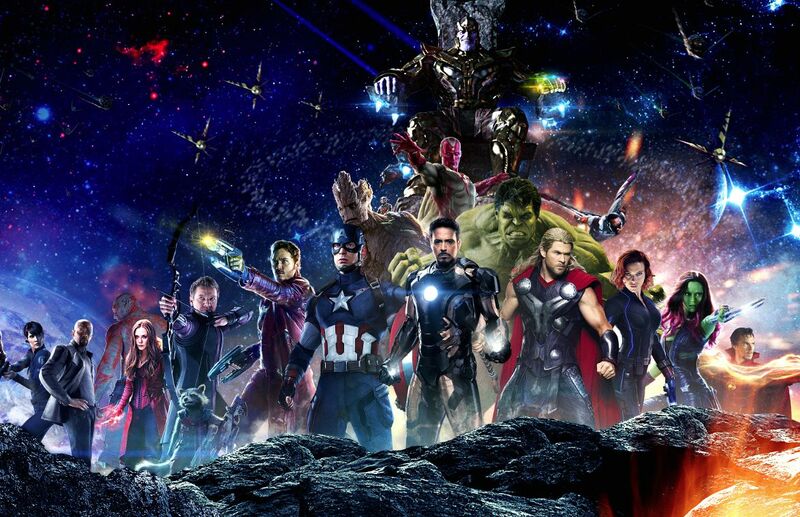 Each successive film in the MCU built upon a shared-universe platform that culminated with The Avengers and continued on with the Phase Two MCU films that concluded last year. Now the Phase Three films of the MCU promise to up the ante in superhero madness that will conclude with the two-part Avengers: Infinity War. 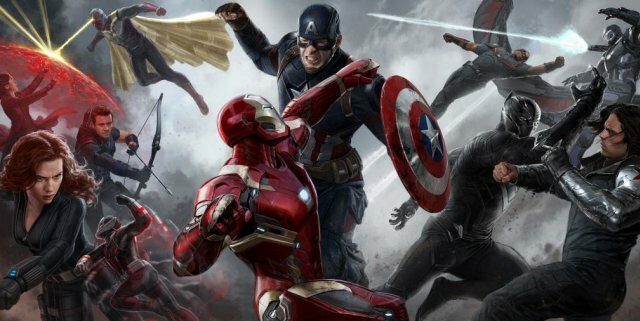 Most likely the MCU will have undergone an upheaval that will begin with Captain America: Civil War. How so? For starters, Spider-Man is now officially part of the MCU and is the grandest prize in Marvel Studios’ quest to regain the film rights to the Marvel Comics characters. As most people know Spider-Man, Fantastic Four and the X-Men have their film rights owned by other studios. Ever since the success of Iron Man and other early MCU films, Marvel Studios has been methodically regaining film rights to their characters. 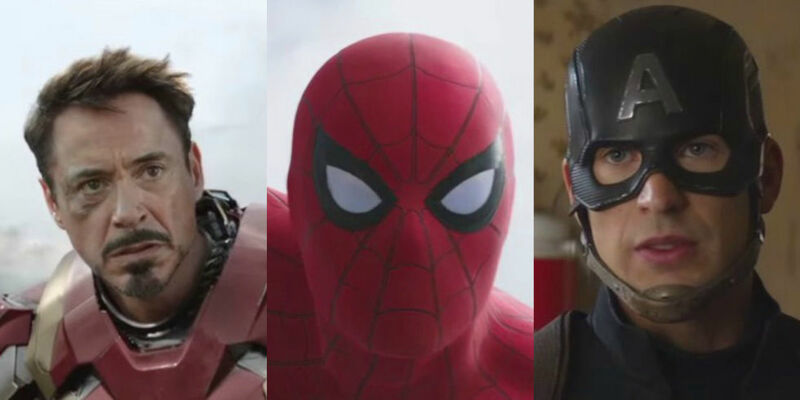 Now that the webbed wonder is “shared” by Marvel Studios and Sony Pictures, who is next? The most likely target is the much- maligned Fantastic Four. Currently, Fox has the film rights and by now it is clear that the movie studio does not know how to translate Marvel’s First Family into the big screen. 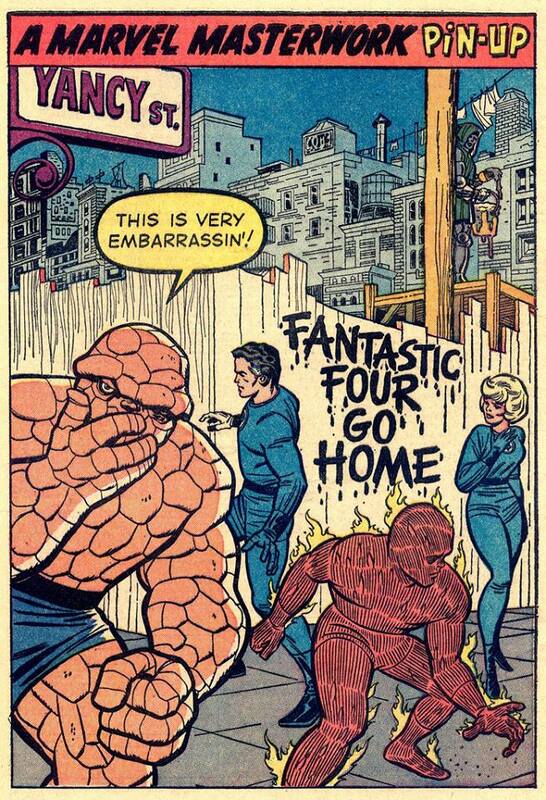 The hot rumor going around the Internet lately is that Fox selling/trading the rights to the Fantastic Four back to Marvel is a done deal. Speculators point out that Fox being allowed by Marvel to go ahead and develop TV shows based on the X-Men franchise somehow proves this. It is believed that Marvel would not just give up the TV rights lightly. Some serious haggling must have occurred and short of giving back the X-Men to Marvel (maybe our grandchildren will live to see that happen), the only bargaining tool Fox had was the Fantastic Four. Doubters will say that both studios denied this, but remember that Sony and Marvel denied until last year that Spider-Man would join the MCU and we know how that turned out. The thing to watch out for is the film slate for unannounced films after Avengers: Infinity War, Part II, especially now that the Inhumans film has been placed on hold. It is quite possible that Marvel wanted to make room for a potential Fantastic Four film after the Avengers or to kick off Phase Four. Nothing would thrill fans more than to see the FF make an appearance or even have an Easter egg in Avengers: Infinity War, Part II, which would set up a solo film nicely, just as it is happening now with Spider-Man. If this is going to happen, Marvel is not ready to reveal this, so as always, we have to wait and see. Of course, this doesn’t help soothe any hurt feelings for anyone who eagerly anticipated Inhumans. Frankly, the property hasn’t taken off in popularity despite Marvel’s best efforts in the comic books and the TV series Agents of S.H.I.E.L.D. The Inhumans were supposed to take the place of the X-Men as part of the turf war that Marvel is having with Fox. But with tensions thawing between the two entertainment giants, the Inhumans lost their appeal. A reason for that can be placed to Agents of S.H.I.E.L.D. since the show is spending a lot (or too much according to unhappy fans) of story time to the Inhumans and what has been shown so far about them hasn’t exactly captured the imagination when compared to the X-Men. Another reason based on more Internet rumor has to do with MCU honcho Kevin Feige no longer answering to Marvel Entertainment CEO Ike Perlmutter. Allegedly, relations between the two were less than harmonious and now Feige is in charge of the film franchise while Perlmutter handles the TV properties. Since Inhumans have appeared first on TV, well…put two and two together. It’s just hearsay and we won’t get the actual truth for a very long time, but it is intriguing. Don’t fear for the Inhumans though. They’ll make their appearance on film one of these days. They can do so in a Fantastic Four film. Enough with the speculating and let us concentrate on the confirmed menu coming our way. After Captain America and Iron Man finish duking it out, we finally meet the Sorcerer Supreme, Doctor Strange this November. Next year our favorite Guardians of the Galaxy return, Spider-Man will have his grand homecoming and Thor and Hulk have a buddy film. Afterwards in 2018, Black Panther gets his solo outing, Ant-Man returns with the Wasp and the Infinity War begins. 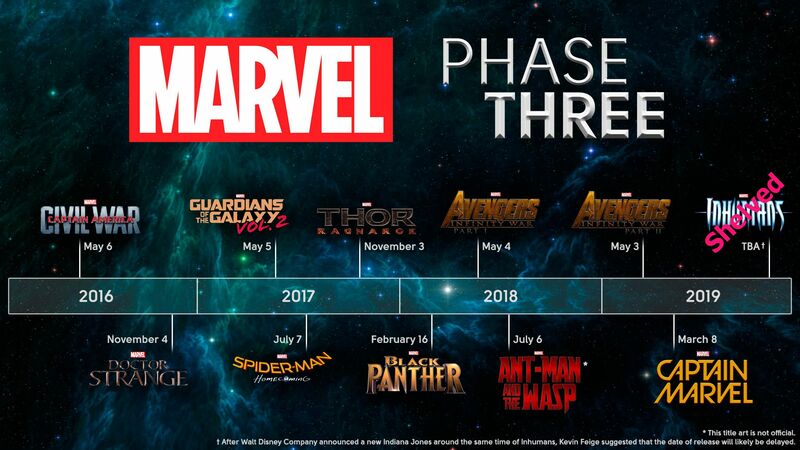 Finally, Phase Three concludes in 2019 with Captain Marvel and the conclusion of the Infinity War. We fans certainly have a full plate! Wow that was intense! 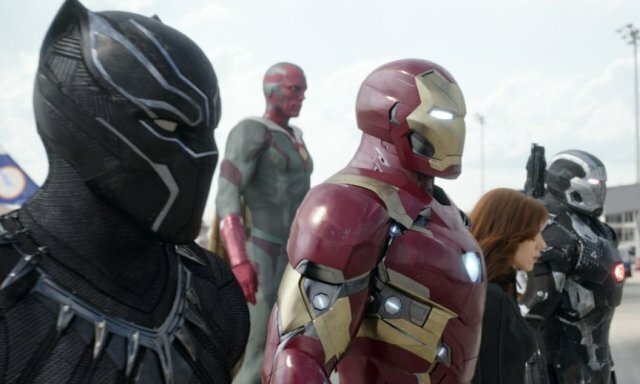 Marvel Studios just released the second trailer for May’s Captain America: Civil War and it is just jammed full of “Wow!” moments, especially at the end (more on that later). Even though Batman v Superman: Dawn of Justice is taking center stage lately and for good reason, I get the feeling that come May, the DC movie will be forgotten once Captain America: Civil War comes out. It’s because by now, we’re all familiar with these beloved characters on screen (and the actors portraying them) and have rooting interests on one side or the other. Iron Man (Robert Downey, Jr.) is well entrenched and uber popular thanks to Downey’s performances and the good memories from the first Iron Man film. As for Captain America (Chris Evans), seemingly overnight, well ever since the release of Captain America: The Winter Soldier, he became a star that is popular with the masses.